Below are common attributes associated to Purple Diamond Loropetalum. Become a care taker for Purple Diamond Loropetalum! Below are member comments regarding how to plant Purple Diamond Loropetalum. No comments have been posted regarding how to plant Purple Diamond Loropetalum. Be the first! Do you know how to plant Purple Diamond Loropetalum? Below are member comments regarding how to prune Purple Diamond Loropetalum. No comments have been posted regarding how to prune Purple Diamond Loropetalum. Be the first! Do you know how to prune Purple Diamond Loropetalum? Below are member comments regarding how to fertilize Purple Diamond Loropetalum. No comments have been posted regarding how to fertilize Purple Diamond Loropetalum. Be the first! Do you know how to fertlize and water Purple Diamond Loropetalum? Below are member comments regarding how to deal with Purple Diamond Loropetalum's pests and problems. No comments have been posted regarding how to deal with Purple Diamond Loropetalum's pests and problems. Be the first! Do you know how to deal with pests and problems with Purple Diamond Loropetalum? Looking for Purple Diamond Loropetalum? Get Purple Diamond Loropetalum fresh and large directly from the grower to your garden! Buy Purple Diamond Loropetalum online from the nursery wholesalers and save BIG! Loropetalum prefers moist, but well drained, rich humusy, acidic soil, but it seems to adapt to less than ideal conditions. They flower best and have the attractive leaf color when planted in full sun. They will tolorate some shade, but in more than 50 percent shade the plant will be less stricking than in the sun. Before planting add generous amounts of organic humus into the planting soil to prevent root rot which can occur when roots are wet constantly. This can be a problem in poorly-draining clay soils. Be sure to set the plant so that the root ball is right at or just above ground level then add a layer of mulch to help top layer of soil from drying out and keep shallow roots cool in warmer weather. Loropetalum needs very little pruning if left to grow in their natural form. In early spring you can prune out any dead or old growth that may have been damaged from winter weather. As with other early-spring blooming plants, should you need to shape or prune to confine its growth it is best done after blooming. Fertilize the Loropetalum in April or after spring blooming and again in June to encourage growth. Use a slow-release ballanced tree and shrub food. Follow the directions on the package, but apply the fertilizer lightly. Water in well so as not to burn shallow feeder roots. Purple Diamond Loropetalum has no insect, pest or disease problems. Consistently wet soil can cause problems with the roots so always plant in a well-drained site. 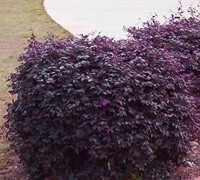 Purple Diamond is a smaller growing loropetalum (4-5' x 4-5') making it an excellent selection for foundation plantings. It is also useful as a natural or formal hedge or in small or large groups for splashes of outstanding color.